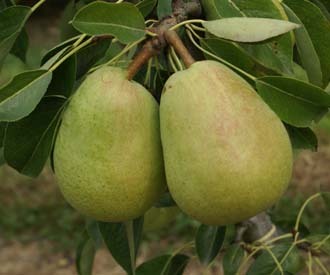 A very hardy pear suitable for colder less sheltered locations where it is normally difficult to grow pears. Invincible is a new variety raised by the Delbard Nursery in France. Invincible is well named because it is tough and hardy, setting heavy crops each year. It is frost resistant and will often produce a second flowering after a heavy frost. It is also very precocious giving good crops from a younger age than other varieties. The fruit is of fair quality and can be used for eating fresh or cooking.